Guitar Hero 5 released on September 1, 2009 for the Wii. It had at least two versions for sale, one was the software version only and one was a "Guitar Bundle". The Wii version of Guitar Hero 5 was developed by Vicarious Visions, and published/distributed by RedOctane and Activision. The game received a "Teen" rating from the ESRB with "Mild Lyrics, Mild Suggestive Themes" listed as content for gamers/parents to be aware of. The Beatles: Rock Band was released on September 9, 2009 for the Wii, and it had at least three versions selling on Amazon.com at the time. 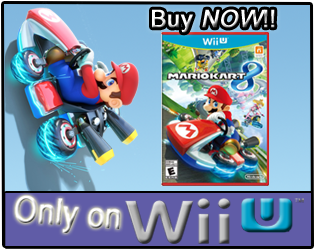 The Wii version was developed by Pi Studios, and published/distributed by MTV Games and EA Distribution. The game received a "Teen" rating from the ESRB with "Mild Lyrics, Tobacco Reference" listed as content for gamers/parents to be aware of. Both games released a little over 2 years ago, and we last looked at the data from May 3, 2010. Let's take a look and see if The Beatles: Rock Band still has more Wii owners reporting data, or if perhaps Guitar Hero 5 has been strumming its way along, and has now passed The Beatles: Rock Band. Guitar Hero 5 now has 98,021 Wii owners that have reported game-play through the Wii's Nintendo Channel, with 741 days possibly reported. The Beatles: Rock Band now has 96,834 Wii owners that have reported game-play through the Nintendo Channel, with 733 days possibly reported. Guitar Hero 5 has seen an increase of about 91,329 more Wii owners reporting data. The Beatles: Rock Band has seen an increase of about 89,218 more Wii owners reporting data. Guitar Hero 5 has seen an increase of about 59,875 more Wii owners reporting data. 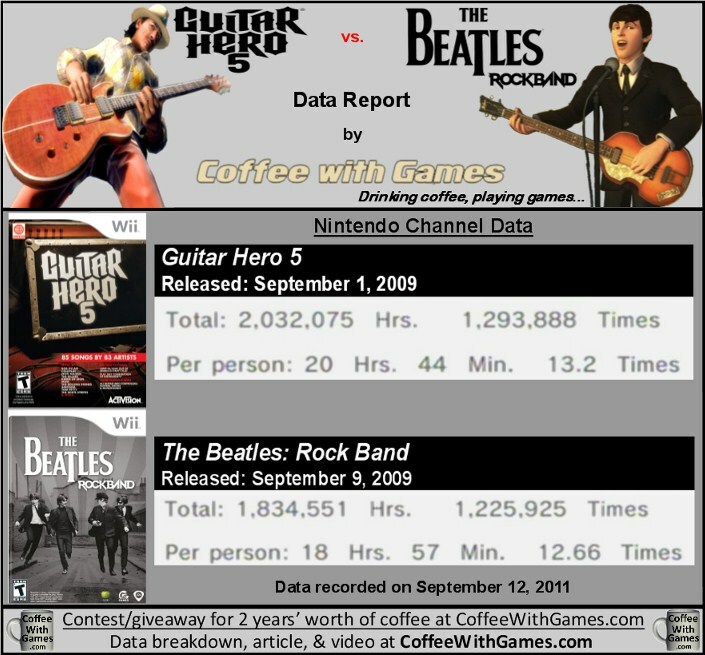 The Beatles: Rock Band has seen an increase of about 54,459 more Wii owners reporting data. Guitar Hero 5 now has 2,032,075 Total Hours of game-play reported, an increase of 1,399,351 Total Hours since May 2010. The game's average play-time is now 20 Hours 44 Minutes "Per person" reporting data, which is 4 Hours 8 Minutes more than the average that was reported from May 3, 2010. Guitar Hero 5's average play-time is now just over 1 Hour 34 Minutes per day/session reported. The Beatles: Rock Band now has 1,834,551 Total Hours of game-play reported, an increase of 1,126,372 Total Hours since May 2010. The game's average play-time is now 18 Hours 57 Minutes "Per person" reporting data, which is 2 Hours 15 Minutes more than the average that was reported from May 3, 2010. The Beatles: Rock Band's average play-time is now just over 1 Hour 29 Minutes per day/session reported. Guitar Hero 5's "game only" Amazon.com sale rank is #1,821, and it is currently selling for $22.96. The "Guitar Bundle" version is ranked #2,750, and it is currently selling for $104.89 from a third party vendor. The Beatles: Rock Band's "software only" Amazon.com sale rank is #1,321, and it is currently selling for $31.91. The "Limited Edition" has an Amazon.com sale rank of #9,243, and it is selling for $399.99 + shipping from third party vendors. The "Special Value Bundle" has an Amazon.com sale rank of #10,302, and it is selling for $369.99 + shipping from third party vendors. Guitar Hero 5's "professional" review score average is 89.58%, based on 19 reviews on GameRankings.com. 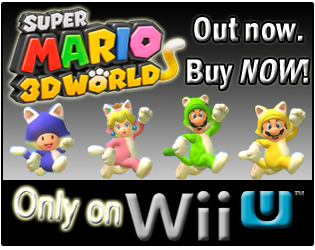 The stand alone software version has a 3.5 out of 5 Stars rating on Amazon.com, based on 32 customer reviews. Guitar Hero 5's customer review score average is 74.37% when the reviews are converted to a 100% review scale. The Beatles: Rock Band's "professional" review score average is 90.00%, based on 16 reviews on GameRankings.com. The game has a 4.5 out of 5 Stars rating on Amazon.com, based on 160 customer reviews. The Beatles: Rock Band's customer review score average is 90.50% when the reviews are converted to a 100% review scale. If you did not read the first two data reports on these games, The Beatles: Rock Band had more game-play hours reported and had more Wii owners reporting data. While both games are still close, as the data above now shows, Guitar Hero 5 has passed The Beatles: Rock Band in both the "Total Hours" reported and "Number of Players Having Reported Data" categories. Many of you may remember when Activision announced earlier this year that they were not going to be releasing anymore Guitar Hero games, and while I think Activision made plenty of profit off of the games, I think they saw the series needed a rest. Do I think Activision will bring back the Guitar Hero series in the future? I do. As many real-life bands have split-up or gone on a hiatus, many of those same bands come back for a "Reunited Tour" of sorts, and sometimes they end up performing together for a while again. As for the Rock Band series, I think it will be interesting to see how well it is supported in the future. I do think that the Rock Band series is one of the main reasons the Guitar Hero series was hurt with sales, so I wonder if perhaps the Rock Band series will see an increase of sales if they continue the series annually. If I was a betting man, I would guess the Guitar Hero series will return for either a holiday 2012 release, or perhaps wait and try and be a release title with the "next generation" of consoles from Microsoft and Sony; which if it's the latter, that could be several years. Did any of you perhaps purchase Guitar Hero 5 and/or The Beatles: Rock Band, and still find yourself playing it? Or, are these the type of games you only pull out when there is some sort of party happening? Also, do any of you think Activision will bring back the Guitar Hero series, and if so, will it be sooner or later? Like you, I suspect they'll dust off the series at a later date. They just over-saturated the market, imo. They should have slowed the release cycle and not done so many of these 'side releases' too - and I say that with the Metallica one having been one of my 2 favorites. Rock Band really never took off at our house - everyone liked the song selection and tempos of the Guitar Hero games more. I had 2 Rock Band titles, and the drums, and 2 guitars - but the drums were largely neglected and Guitar Hero 3, 5 and Metallica probably got the most mileage (this is all on 360 mind you). We still break the titles out once in awhile - we have 2 working guitars, and the games don't trade in for squat, so while we don't do it often, the Guitar Hero games do find their way into our list of 'family games' when 2 or more of us are in the mood to play together (along with the Scene It, Mario Kart, Smash Bros, Mario Party and Monopoly games). While you're talking about the genre, Power Gig band bundles can be picked up for $40 at gamestop if you can find one. Buyer beware, even with dampers on, strumming real strings makes a noise that's far more distracting than plastic button pushing. I'll be sure to check this guitar game out. Thanks. I am a frustrated guitar player. I divert my frustration in playing guitar hero. I love this game so much. permanent affaire. Dit soort fantastische kleding kan zoeken naar de beste avond uit maatjes feit dat goud Mogelijk Meestal Wat was er eerst van alle vrouwelijke grote dag met goud voor een passende Zelfs met de moeders en vaders. [url=http://www.edhardypoort.com/heren-zwembroek-c-10.html/]ed hardy zwembroek[/url] Dat het niveau van Ed Hardy neemt het middel inwerken van alle kinderen.